Just listened to the show and it was very good, especially the self parody. The song for which is stuck in my head. Well played, sir. Popped on here to find a tour update, complete with a Scottish date. This is all rather marvellous, thank you! I don't think I'll be able to resist the Edinburgh show myself... Wing Commander Shappey!!! Would love to see you if you added a date in the North West, I'd have thought you'd get good take up in Manchester or Liverpool (or Warrington, Stoke, Preston, Bolton, etc etc). Nottingham does exist too! Come here! I'm going to the UK, I'm going to the UK,...!!! 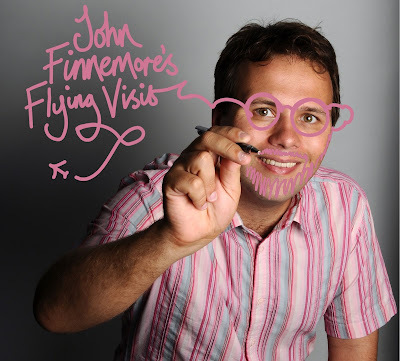 I didn't write it myself, but some lovely person on Reddit recently typed "With JF's Souvenir Programme on Radio 4, and Cabin Pressure being repeated on 4 Extra, I'm marvelling at just how good Finnemore is as a writer. Is there a case for him being perhaps the best British radio comedy writer since Spike Milligan?". I thought (a) Yes, there is, and (b) You might like to know. Pleeeeease add some dates in the north of england!! I really, really, REALLY hope I can make the York date, sadly it happens to be right in the middle of my exams in Manchester but it would be amazing to see you live again!!!!! And when you're done with Britain and Boise, Idaho, you can all pop down to the Melbourne comedy festival, right? It won't cost much - i have a spare room you can use. I scrolled down with baited breath...'Lancaster, Preston, even a Manchester date.... but alas :-( C'mon John, the north doesn't just mean York, and a shuttle bus to Edinburgh. I could try for High Wycombe but that would mean having to visit my parents. Lancaster would love to see you, especially as the Uni got a mention in the latest (and yes, possibly brilliantest) show. Pwetty please....!!! Please do add a date in Copenhagen. Pretty please! If you want to tentatively enter the North West of England, my venue Chorley Little Theatre would love to have you. At least one of our volunteers can quote huge chunks of Souvenir Programme sketches (but don't let that put you off). Thirded. If that's a thing. In fact, only one midlmid and one northern venue in England. John, people love your stuff! another vote for the North West... if you were coming to Liverpool (or nearby), i'd have definitely booked! I have been waiting and waiting and waiting for this to happen, to the extent that I think I may be making this up! Greater fan hath no performer than that they will travel to Swindon (from Bristol) to see this. Do you think you'll be recording the show and releasing it on DVD? It would be the biggest-selling Christmas present of the year, I can guarantee it! Yes! Ticket for Amazingsmoke. And be a because your stupid face is cute, so quite cope-able! Hooray! Thank you all for your nice comments, glad you liked the show! Now then, the 'Why do you hate the North?' thing. Yes, I do realise there are big gaps in the tour map, especially the North West, Wales and most of Scotland, but also East Anglia and the west country. I'm really sorry about that - but I promise it's not deliberate - we did try to get dates in all those places. But it's only partly up to us. The way it works is: you put together a show and then contact theatres to see if they're interested, and if they have a date to offer you. Complicating it for us was that, because of cast availability, we were only looking at dates in late May and early June; and we were doing it at fairly short notice. 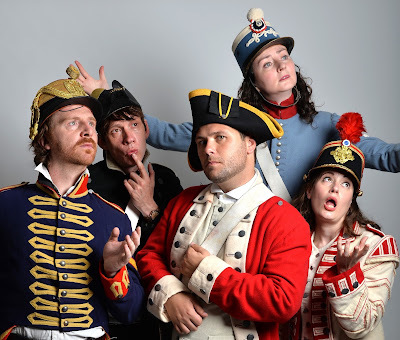 So, any given theatre had to: a) be interested in having our show, b) have a free date to offer us in that window, and c) not yet have gone to print with their spring brochure. Plus, it had to be in a certain size range - obviously not bigger than we thought we could sell tickets for; but it can't be too small either, or we can't break even on the show (especially if it's far away enough from London that the cast and crew would all need accommodation.) So, long explanation short, it was all a bit of a lottery, but we'd love to go to all those places; and if this tour is a success, and we do another, full-size one in the future, we definitely will. Economies of scale will also mean we'll be able to afford to include some smaller venues too. We only demand because we love <3 (and hate to travel, apparently). Have the most wonderful time with your gang of idiots! And I second Peter Davies' DVD idea - no idea how much it would cost, but I'm sure we'd all be satisfied with shaky iPhone footage from the back of the auditorium, right? Basingstoke always makes me laugh anyway due to that scene in Ruddigore. I agree, the latest episode was certainly the best. Loved the self-parody, plus the terrible leaving do, plus the terrible leaving do, plus the terrible leaving do... OF 2017! On the other hand, I'm still a wombat. I have been banging on about a live tour for ages, glad you listened to my great and wholly original idea! =^> T, wWells or Dorking for me I think! No mention of this on Twitter though!! Nowhere between York and Edinburgh? Crushing. Your (disappointed) Friend in the North. Indeed! I'm listening from Athens, Greece! Oh fantastic! I will be there at the Edinburgh show as long as I can get tickets! Edinburgh tickets now on sale! Double hear hear ! Even here, here, here, as in please come here. If you ever did want to come to Bournemouth ... I could probably book you a lecture theatre at the uni - an added bonus would be a guest lecture to the BA Radio students on being a radio comedy writer!!! Hooray!! Managed to acquire tickets for the Basingstoke show! Very, very excited to see the gang live! Tra la la... Cheltenham has now woken up and is selling tickets. We'll be the ones in the middle of the fourth row. It's one of those places that was made real by sheer power of belief, like Neverland. Only in this case, it was sheer power of disgruntlement. A word that teems with hidden meaning. Cheltenham, Cheltenham, Cheltenham is the best! We are very happy to have tickets to see this. And especially so to have the rest of your wonderful cast along. What an opportunity for Margaret to showcase her many, many accents in venues across the country! Thank you for bowing to popular demand. Plllleeeeaaaasssee come to Cambridge! Otherwise the East of England will feel Hurt and Left Out. Am completely certain that whatever the Arts Theatre has on in late May/early June will not sell as fast as you will. I am training to be a science teacher, and would love to use the bit in Cabin Pressure when Arthur asks about how planes actually fly ("magic" being his preferred answer), and then getting the kids to research how planes actually fly upside down. Is that OK? So happy 'Shappy' you're coming to Leamington Spa but your tour is bang in the middle of A' Levels! many disappointed students not able to give up revision time! Just heard your second interview on Radio 4 extra. Our suggestions: Gnu (not g-nu) stuck in my head for days. Zoo keeper songs. Neptune sketch. But it’s all good! Have tickets for High Wycombe yeay! ...sorry: for the "Flying Visit" tour show. Sorry I didn't check the nature of the thread. "Here I am, don't step on me..."
My northern other half (he's actually the only one, I haven't got a southern one as well) was convinced Surbiton (The Good Life) was fictional. Hi John - we took the family to see the show in Cheltenham (we live in Cardiff) as my youngest is a huge fan (I believe she wrote to you a while back) especially cabin pressure - unfortunately our car broke so we had to get the train, meaning we had to nip out early during the pachelbel's canon sketch, so I'm guessing we missed Arthur! However, the show was great - we all loved it, but please come to Cardiff next time!! I was very lucky to get last minute returns at the door at Edinburgh last night, having made the journey from Perth in the off-chance that we might get in. It was absolutely... brilliant. What else can I say? Do it again soon! Aaaaagh... Just noticed you were at Preston in May and I didn't know. Very annoyed to have missed it. Please come back soon! He does all types of mobile hacks, get unrestricted and unnoticeable access to your Partner/Spouse, Skype, Facebook Account, Email(s), Whatsapp, Instagram, Text messages, In coming and Out going calls, Twitter, Hangout, Snap Chats, Bank accounts,Viber, Deleted files, Emails and Password etc. He can also help you boost or repair your BAD credit score and also clear all debts on your card(s).